X5 uses high-quality rubber material to create the mouse wheel, and add 3D anti-skid texture, allowing you to instantly into the passion of the game battle. X5 uses high quality rubber material to create the mouse wheel, and add 3D anti-skid texture, allowing you to instantly into the passion of the game battle. • The overall design of X5 is simple lines, stylish and generous, full of personality. • Simplified but not simple. X5 equipped with a professional gaming chip and optical engine, strong performance, sensitive tracking. • Skin-friendly non-slip surface, cool backlight. X5 uses skin-friendly rubber oil for spraying, anti-sweat and non-slip. • Cool laser engraving. X5 comes with the laser engraving technology, carving out cool texture in the surface. With built-in colorful LED breathing lights, it is shining and moving. • 3D non-slip wheel and flank, bid farewell to butter hand. X5 uses high-quality rubber material to create the mouse wheel, and add 3D anti-skid texture, allowing you to instantly into the passion of the game battle. 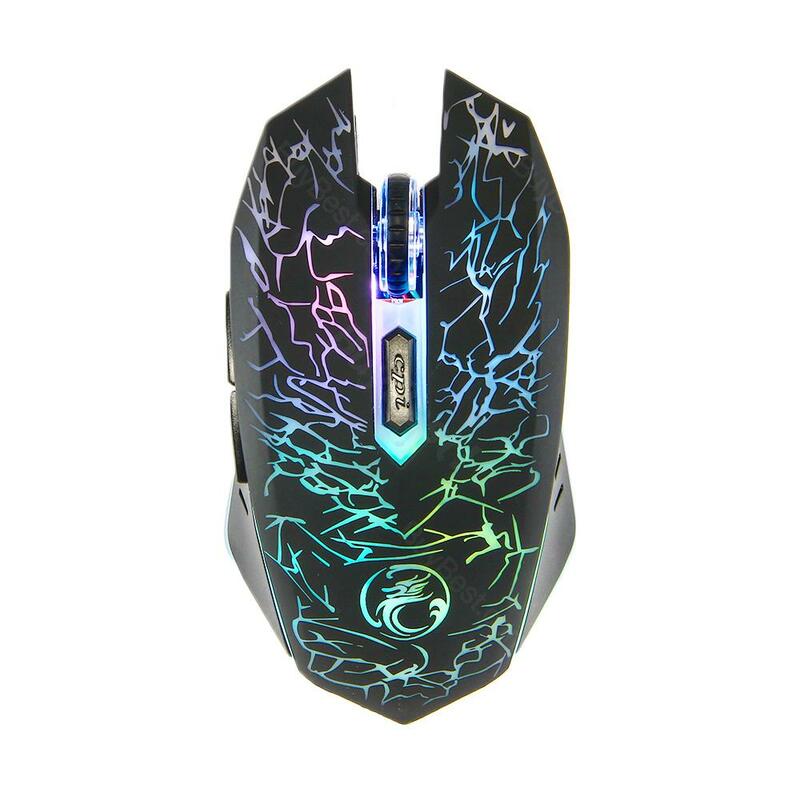 This gaming mouse is very well designed and also longer than most standard mice (at least it appears to be visually. Did not measure and compare). It is very comfortable to use and is a great touch for an RGB or single color themed work space or gaming station. Everything works plug and play out of the box, although you cannot program it without installing the drivers for the mouse that enable you to adjust colors and make custom functions of the buttons. Although that is great that there are drivers, there is no included disk for them. They need to be downloaded from the Blade Hawks website and I did not see a mention of that on the packing or user manual when referring to the software. So, I bought this gaming mouse for uses other then gaming. The multi-button controls on a mouse could be very useful, as it definitely is. Let's start with the basics. The package came in, and it was very nicely packaged, a box in a box. This was bubble wrapped to ensure damage did not occur during transport. I appreciated that, as this mouse houses more electronics than the average mouse. Upon opening the package, I see the Blade Hawks GM-X5 gaming mouse, a Quick User Guide, and a thank you card with a registration for a 2 year extended manufacturer warranty. Now it seems like everyone wants to charge for something like a warranty, and yet here is a pleasant surprise. I bought this mouse for 2 reasons. Quiet clicking and it’s lighting. It’s a great little mouse. I use it at school so I can be quiet while lecturing is taking place. It feels good in the palm of my hand and it is got a fantastic rechargeable battery that lasts for quite a while before having to recharge(even with the lights on all the time. I wish it came with some kind of documentation on how to change or reset the buttons but that’s not a deal breaker. The usb receiver is a little lightweight so he careful not to bang it against anything. I love that it changes colour and how comfortable it is in the hand. It's very responsive and I also love that it's got backwards and forwards buttons on it. Nice mouse for regular usage. Great gaming mouse. Feels sturdy and built from quality components. Extremely accurate sensor is great for FPS games. This mouse is really good for small - medium sized hands and ergonomically it is one of the best mice I've used. The software is easy to use and RGB is a nice touch. I switched from the Logitech G403 and have been using the Revenger S since. Mouse is fine in terms of hardware and software, since I think they fixed all of the bugs in terms of software.